In May 2018, I flew to Japan to attend a healing conference called the "School of Power and Love" with Todd White , Robby Dawkins, and Tom Ruotolo. I took several attendees onto the streets of Tokyo to teach how to heal the sick and tell others about Jesus. Christians only make up 1 percent of the population of Japan, and they are dedicated, sincere, and love the Lord, but lack "hands on" training on how to heal and win souls. Since I have had some training and seen results, I was asked to take new folks out to experience healing first hand. We saw 21 souls, 11 healings, with many others feeling the manifestation of the Holy Spirit through warmth and heat in their bodies. A Tokyo policeman was one of them. Though he would not take the tract I offered him, he did pray and receive the Lord and those watching learned that all God's children need Jesus. My photo made it a Christian Newspaper as we hit the streets. A photographer for a Christian Newspaper followed me around for a few hours . We prayed and healed different people we had met. 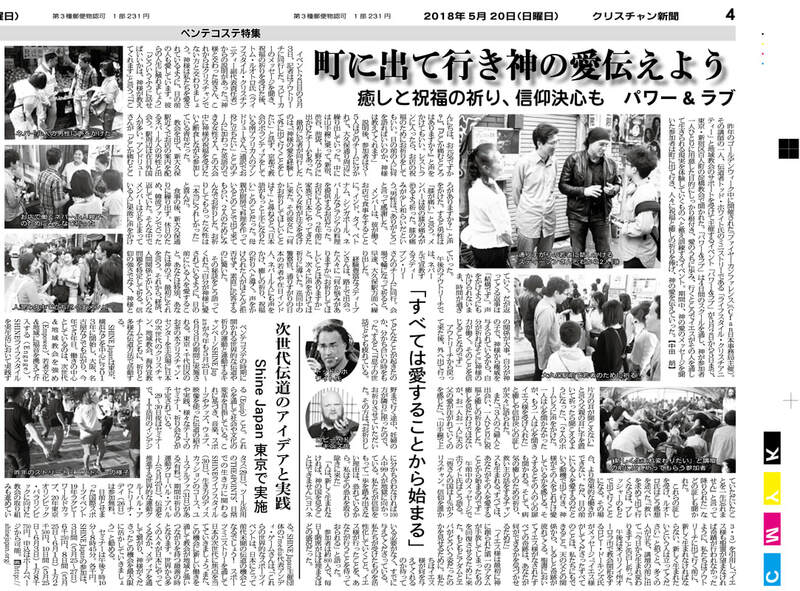 This is the article that was published in Japanese.